This partnership began with an exchange programme between the Catholic Church of Soroti and Osnabrück club in Germany. During this programme, part of the delegation was made up of staff from TASO Soroti who talked about their organisation. Among those listening was a member of the Rotary Club of Osnabrück. After hearing about the great work being done by TASO, the TASO Staff together with Christine Kaiping of Aidshilfe für Afrika (AfA) initiated the partnership in 2005 with support from the Rotary Club of Osnabrück. AfA is an organisation which was founded in November 2005 to contribute to the fight against AIDS in Africa, supports the TASO unit in Soroti. Provision of ART services and general drugs for 200 clients (out of the 7,504 active clients registered at TASO Soroti) to enable them live a better and healthier life. Automated Laboratory equipment worth 40,000 Euros including a machine to count CD4 cells (FACSCalibur machine) ,Chemistry analyzer machine, air conditioning for the Lab and data rooms. Funds are also spent on replacing lab reagents. Sustainable Livelihood programmes for clients such as giving households fruit trees, goats and sheep. Facilitation to the implementation of Prevention of Mother to Child Transmission of HIV, through nutritional supplementation to both mothers and babies, procurement of delivery kits for expectant mothers. This was initiated in 2010. In 2011, Prof. Wolfgang Lenzen from AfA led a national bicycle rally to raise funds for TASO involving all the TASO Centers. It was also used as an event for HIV Counseling and Testing, community sensitization and mobilization, in that people along the highways of the bicycle rally route in over 20 districts received information on HIV and AIDS as well as condoms for both HIV prevention and Family Planning. 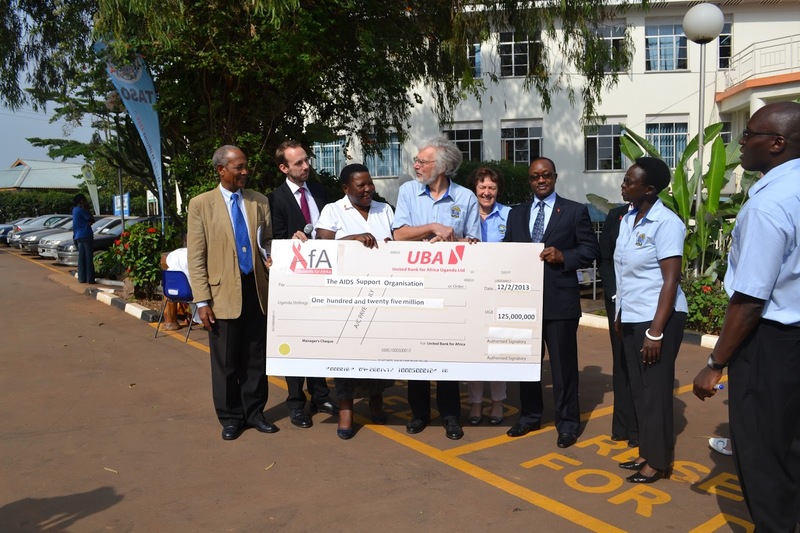 A total of 5,769 Euros was raised and the cheque was handed over to TASO Management in February 2013 in Kampala. To date TASO has received a total of 288,000 Euros which has greatly supported the PLHIVs in TASO Soroti to live better and more healthy lives. TASO is very grateful to AfA and the Rotary club of Osnabrück for this great partnership and especially for all the financial and material support given to its clients.